Powers/Abilities: The Red Lord possesses incalculable power, which increases as more damage is inflicted upon Earth's ecosystems. He can alter his size and shape, growing to at least 40' tall. His healing factor regenerates lost or damaged body parts. He leads the Bane, elemental lords of winter and warfare who augment his power by eroding life and violating nature. As Bodb Derg, he possessed the superhuman physical attributes of a Celtic god. (Thor & Hercules: Encyclopaedia Mythologica) - The Red Lord is an aspect of the primordial Earth Mother Gaea. (Knights of Pendragon I#12 (fb) - BTS) - The Red Lord represented the corrupt essence of winter and warfare. Since Earth's dawn, he has opposed his opposite, the Green Knight, who represented life and growth. (Knights of Pendragon I#10 (fb) - BTS) - The Bane were the Red Lord's champions on Earth. (Knights of Pendragon I#7 - BTS) - In ancient times pagan rituals were performed in Joselito, Spain. (Knights of Pendragon I#11 (fb) - BTS) - He was worshiped in paleolithic times in Joselito, Spain. La Fiesta Oscura (the dark fiesta) dates back to pagan times. The locals built a huge auroch, a big bull creature from paleolithic times. They enact a hunt in which the auroch was killed and killed real bulls simultaneously. The nearby caves were a storehouse of ancient elemental power. In old texts they dubbed the place El Tierra Duele, the Wounded Land. The caves were thought to be a conduit to the very heart of the earth-spirit. There are paintings of the Red Lord and the Dark Fiesta in the caves. The ancients sacrificed their children to the auroch. (Knights of Pendragon I#10 (fb) - BTS) - In the caves above Joselito early man documented their exploits as hunters and priests in paintings. It showed them killing and revering the prehistoric bull, the auroch. The area was important to the Green Knight and the Red Lord. (Knights of Pendragon I#18 (fb) - BTS) - ...to the netherworld Annwn. (Knights of Pendragon I#15 (fb) - BTS) - The Spiral Tower became the Red Lord's stronghold. (Knights of Pendragon I#17 (fb) - BTS) - During the "sunless time" it was foretold the Red Lord would rise again. (Thor & Hercules: Encyclopaedia Mythologica) - Over the centuries, Bodb Derg became entirely consumed by his seething sense of greed, allowing his essence to become corrupted by the Red Lord. Empowered by Derg's dark emotions, the Red Lord established a power base in Annwn, directing his loyal Bane henchmen from his Spiral Tower. By having the Bane facilitate mankind's excess and greed, the Red Lord slowly weakened the Green Knight. During King Arthur's time, the Bane, working with Morgan Le Fay, opposed the Green Knight's agents, the Pendragons. (Knights of Pendragon II#10 (fb) - BTS) - At some point Ormond Wychwood became a thrall of the Red Lord. Wychwood even claimed he was part of the Red Lord. (Knights of Pendragon II#10 (fb) - BTS) - In the modern era Wychwood became the person through which Mys-Tech dealt with the Bane. (Knights of Pendragon I#1-10 - BTS) - Directed by the Red Lord the Bane slowly destroyed Earth's ecosystems using the resources of Mys-Tech subsidiary the Omni Corporation. (Knights of Pendragon I#11 - BTS) - Grace intended to use the power generated by the fiesta, a thousand souls screaming in a crescendo of ritual emotion, to awaken the Red Lord. She triggered an explosion in the caves, flooding them with toxic waste. She expected the Red Lord to appear, however, the Green Knight arrived instead, angered at the Bane hurting the land. (Knights of Pendragon I#12 - BTS) - Grace hoped the Red Lord would be pleased with her when she managed to slay his foe, the Green Knight. (Knights of Pendragon I#13-16 - BTS) - The Bane continued to use the Omni Corporation to destroy Earth's ecosystem. (Knights of Pendragon I#17 - BTS) - Grace and the Bane Elders attempted to raise the Red Lord. A mixture of poison, pus and putrescence including cane toad toxin was used was used to fill a pit in the Spiral Tower. While rains the darkling venom and the land doth quake let us reap the dying harvest for the Crimson Lord awakes. (Knights of Pendragon I#18 (fb) - BTS) - Albion's blood was the last ingredient needed to seal the spell that woke the Red Lord. 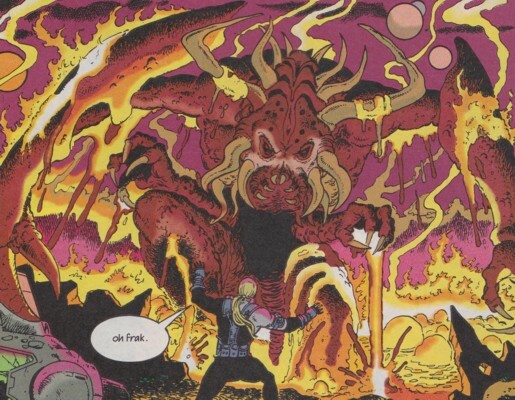 (Knights of Pendragon I#17) - The Red Lord appeared before the Bane. (Knights of Pendragon I#18) - The Red Lord marched with his Bane army to the Green Knight's Green Chapel in Otherworld. He ordered his army to slay the Green Knight, whose Knights of Pendragon opposed the Bane in a brutal battle. 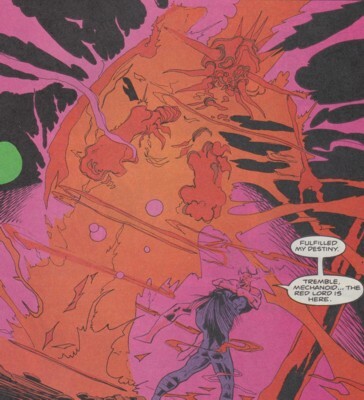 When Adam Crown used his powers to make Grace realize how evil the Red Lord's cause was everyone she had turned to the Red Lord's cause realized how evil it was as well losing a part of his army. Grace wanted an answer from the Red Lord, but he merely complimented the Green Knight on this clever move and returned with his remaining army to Annwn. The balance between the Green Knight and Red Lord had been restored. (Marvel Comics Presents I#122/4 (fb) ) - At some point the Red Lord empowered Alan Trent, who became the Bane's new leader Shadow Wing. (Knights of Pendragon II#1-4 - BTS) - The Bane influenced Iain Gurthrie to blow up the nuclear plant at Cape Wrath in Northern Scotland, but the Knights of Pendragon convinced him not to do it. (Knights of Pendragon II#5) - When Magpie used his stolen Pendragon bike he had used to reach Avalon after Grace had scrambled the bike's navigation memory it brought Magpie accidentally to Annwn where he landed right in front of the Red Lord. (Knights of Pendragon II#14 (fb) - BTS) - The Red Lord and Magpie discovered they both hated the Knights of Pendragon. (Knights of Pendragon II#10 - BTS) - Ormond Wychwood tried the Ceremony of Unification to summon the Red Lord to Earth and become one with him, which would've made him even more powerful than Mephisto. With the help of Baron Blood he had already collected three of the four required sacrifices for the ceremony. When Grace was brought before him to his underground sanctum he tried to convince her to join him by reciting the charm of the summoning ("While rains the darkling venom and the land doth quake let us reap the dying harvest for the Crimson Lord awakes."). Despite proving his connection to the Red Lord she turned on him, but Baron Blood came to his aid. (Knights of Pendragon II#11 - BTS) - In front of the alter dedicated to the Red Lord Grace fought Baron Blood in front of Wychwood, who revealed how Blood had been revived by the power of the Bane and used to collect human sacrifices for the ceremony. Pretending to be possessed by the Bane again Grace called Union Jack, under the pretense he would be needed as a human sacrifice, and told him Baron Blood had returned. Once Union Jack arrived at the Omni Corporation tower, Grace dropped her pretense and helped him fight Blood and Wychwood. Union Jack impaled the Baron with his staff. The vampire fell upon a huge spike in the vacant spot where the final human sacrifice should have gone. His impurity tainted the ceremony, preventing the resurrection of the Red Lord. Wychwood fled back to Mys-Tech. (Knights of Pendragon II#14 - BTS) - With the help of the Red Lord Magpie returned to Avalon. (Knights of Pendragon II#15 - BTS) - Magpie carved subtle charms, cthonic runes and sigils of power into the rocky ground of the Green Chapel to complete a summoning circle to bring the Red Lord to the Green Chapel. He finished it despite Death's Head's interference. (Knights of Pendragon II#15) - When the Red Lord slowly manifested in the Green Chapel the Knights of Pendragon and the Lemurians of Earth-313 found the summoning circle. Death's Head was fighting Magpie again while the other heroes wondered if the Red Lord could still be stopped from fully manifesting in the Green Chapel. Only seconds away from entering Avalon completely Adam Crown, realizing the Red Lord was vulnerable as long as he had not arrived completely, jumped the Red Lord and stabbed him with his mystic sword. In his partially-formed state the Red Lord screamed in pain and fell back through Magpie's portal to Annwn, taking Adam Crown with him. Death's Head tossed Magpie through the portal as well before it closed with a shuddering blast. 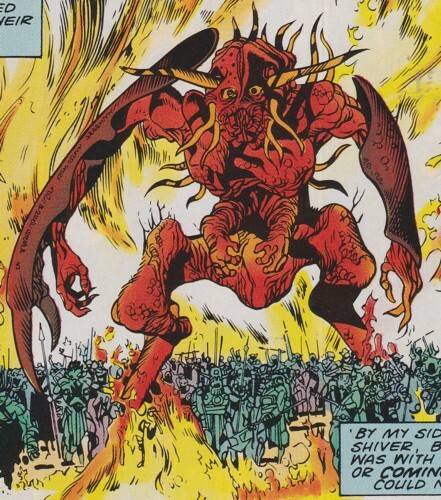 (Journey into Mystery I#641 (fb) - BTS) - Surtur built the prototype god Manchester as part of a deal with Master Wilson. (Journey into Mystery I#640 - BTS) - The druid Master Wilson imprisoned the monstrous Red Lord. (Journey into Mystery I#639 (fb) ) - Wilson left him trapped deep within the metal guts of the god called Manchester. King Arthur, his court and the Tuatha de Danaan didn't miss the Red Lord, but rather toasted his disappearance. (Journey into Mystery I#640 - BTS) - Red Lord's fury powered the Manchester Gods. Master Wilson considered Red Lord's new purpose reparation for all the harm he had caused to the poor people of Otherworld like the trolls that had died in the Red Lord's many wars. To aid Camelot and their allies against the Manchester Gods Loki planned to free the Red Lord to remove the power the Manchester Gods were running on, but after hearing what the Manchester Gods' emissary Master Wilson had to say Loki decided against freeing the Red Lord because Wilson had convinced him the Manchester Gods would bring the peaceful future Otherworld needed. (Journey into Mystery I#641 - BTS) - The Red Lord's fury kept powering the Manchester Gods. Comments: Created by Dan Abnett, John Tomlinson (writers), Gary Erskine (pencils) & Bambos Georgiou (inks). On Arakne the Red Lord was known as Tarashk. He was served by Arakne's Bane counterparts the Scourge. Earth's Knights of Pendragon traveled to Arakne to save the planet from the Warheads and ultimately prevented the summoning of the Red Lord though the Red Lord transformed Vice-Praetor Malekyth. The storyline ran through Knights of Pendragon II#6-9. It is unknown if Tarashk is the same as Bodb Derg, but both were probably corrupted by the essence of Gaea's aspect the Red Lord. 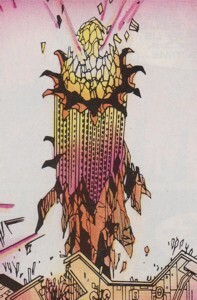 It is also unknown if Arakne was a planet in Reality-616, an alternate reality or another dimension like the Microverse. A lot of unknowns. Profile by Markus Raymond & Changeling. (Knights of Pendragon I#18 (fb) - BTS) - The Spiral Tower was located in the Dark Realm of Annwn. (Knights of Pendragon I#15 (fb) - BTS) - The Spiral Tower is said to be the Red Lord's home and the heart of the Bane's power. (Knights of Pendragon I#13 - BTS) - Albion's tarot showed the Spiral Tower in his future. (Knights of Pendragon I#15: Grace profile - BTS) - After the Bane's defeat in Joselito, Spain and her apparent destruction at the hands of Iron Man Grace retreated to the Spiral Tower to plot the ultimate overthrow of the Knights of Pendragon. (Knights of Pendragon I#15 - BTS) - Peter Hunter's search for a way to destroy the Bane's power base led him to Germany where he met with Richard Dorfman in Bonn. Dorfman was murdered at the library by Grace, but Hunter still found the information on the Spiral Tower he sought. (Knights of Pendragon I#16) - Following the clues Albion realized the Spiral Tower had to be somewhere that stood for the future because that was the only thing concerning the Bane. When the smell of the Bane grew stronger Albion located the Spiral Tower in Bonn's Regierungsviertel. He eventually realized the Regierungsviertel in Bonn was only one way to find the Spiral Tower and that it could probably be accessed from all over the world. Entering the Spiral Tower Albion was caught by Grace. (Knights of Pendragon I#17) - At the Spiral Tower Grace and the Bane Elders bled the chained Albion, then filled a pit with poison, pus and putrescence including cane toad toxin. Grace then decapitated Albion with an axe over the pit to begin the final part of the ritual. She then used an incantation to summon the Red Lord, who appeared in front of the Bane.